Those who say that fashion is fickle, know not of what they speak. 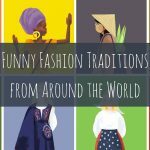 Fashion is much more than just a popular style or practice; it’s a form of art, a time in history, an integral part of modern culture, and a way for people all over the world to express themselves. Like food, fashion binds us together. And for those who love to travel, they’ll likely see a lot of both. 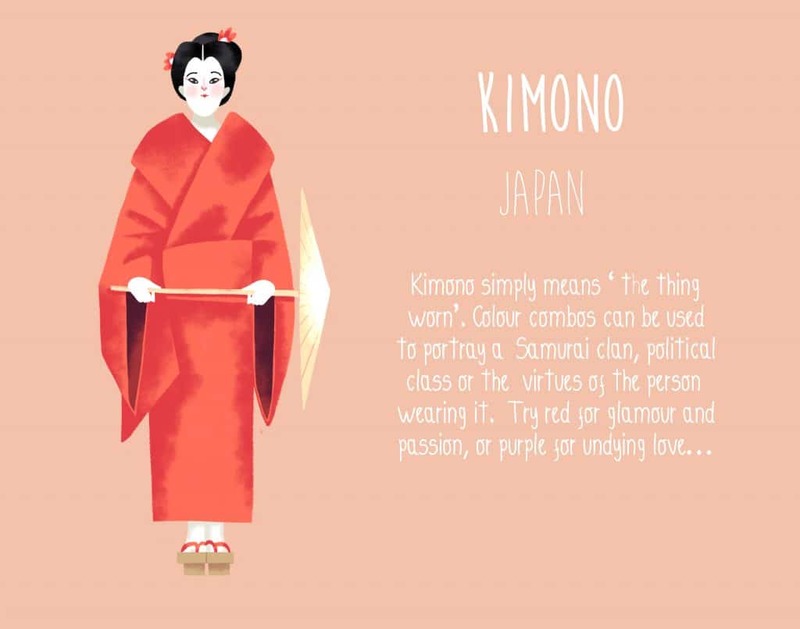 For wherever you are in the world, there will be defining and distinctive tastes (from what people eat to what people wear) and that’s the true flavour of travel. Additionally, the way that people dress can reveal a lot about their history and often comes from practical influences or occupational necessity, so “fashion” as a whole should never be overlooked in our cultural education. 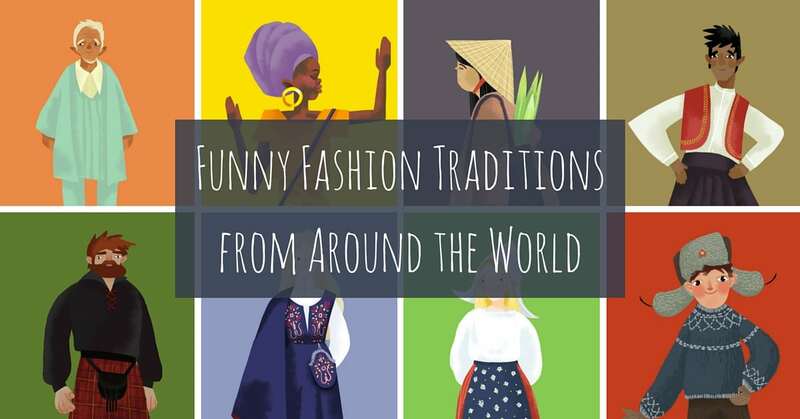 And as famous French designer Yves Saint Laurent once said, “Dressing is a way of life.” So fashion traditions really are a great way of gaining insight into another culture. The traditional Dirndl not only has its practical uses for rural life but this style of dress also has a lot of symbolic meaning for the individual wearing it. 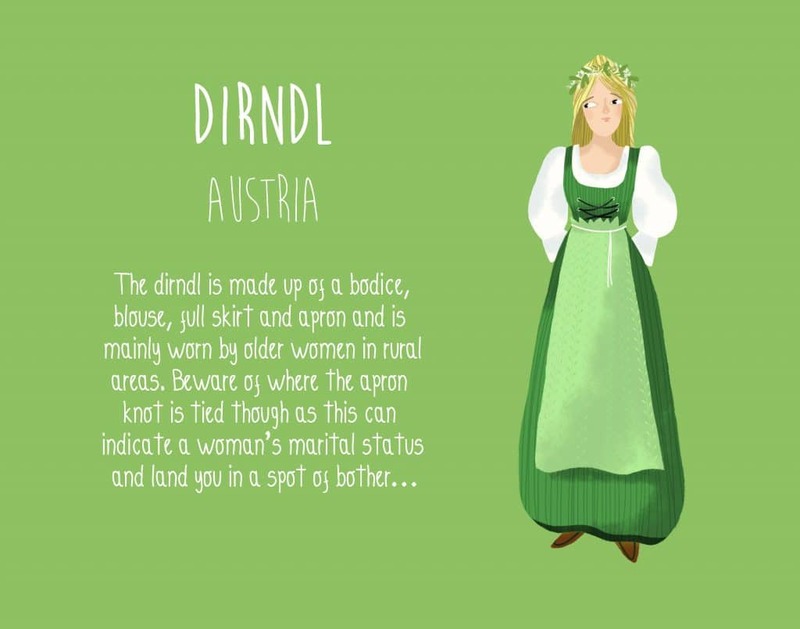 Worn also in Germany, the traditional Dirndl is a popular choice of garment for older women (to be worn as an everyday garment) or is a chosen ensemble for special occasions (perhaps in the same way that a Scotsman would wear a kilt for a wedding or a celebration). But its most notable feature is the way that one would tie the apron knot – the way you tie your apron can be used to show your marital status. Perfect if you want to save embarrassment at a singles event…..but not so handy if you get the knot wrong! In Bhutan, people must wear their national dress at all times if they work in a government office or within the education system. Men are also obligated to wear the national dress for formal occasions such as national celebrations and family events such as weddings. 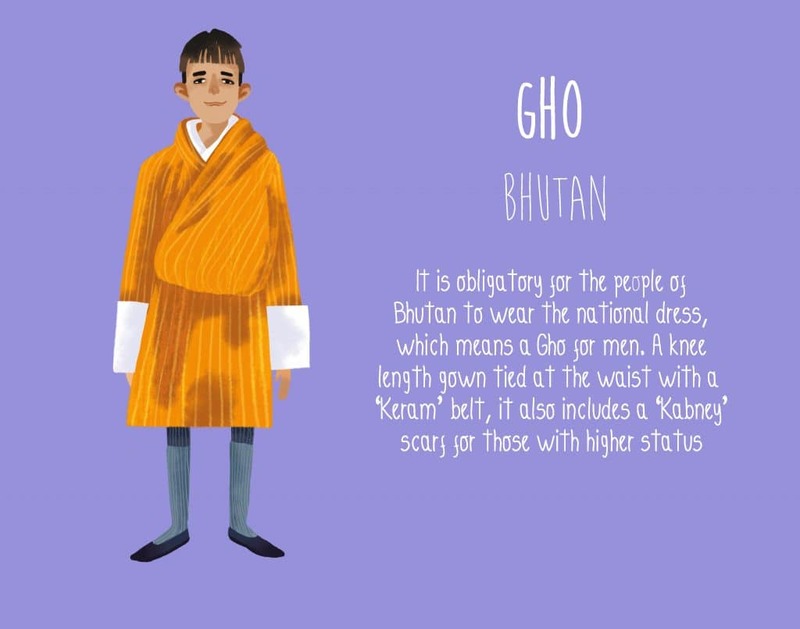 Introduced in the 17th century by Ngawang Namgyal, the Gho (or Kira for a woman) is designed to give the people of Bhutan a distinctive identity – one that can be recognised anywhere in the world. This knee length robe ties at the waist conveniently, and other accessories such as silk scarves or belts can be used to reveal one’s status or to mark a special occasion. The Poncho is perhaps one of the most iconic designs in fashion; yet it is most certainly one of fashion history’s simplest. Made from a flat piece of cloth with a single opening for the head, the Poncho (which dates back to Native American times) was a quick and convenient solution for keeping the body warm. 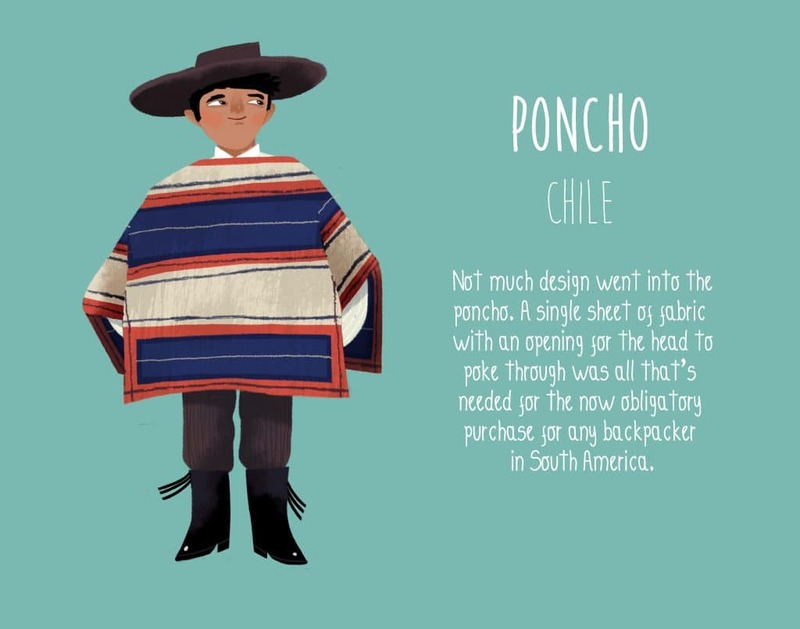 Little creativity went into the design of the Poncho yet it is one of today’s most emulated styles across all corners of the globe. From high fashion to traditional fashion, the humble Poncho top seems to have a place in every man or woman’s wardrobe. If you’re backpacking across South America, it’s a must-have souvenir. It’s easy to wear and will prevent you getting a chill when the weather turns cold at night. 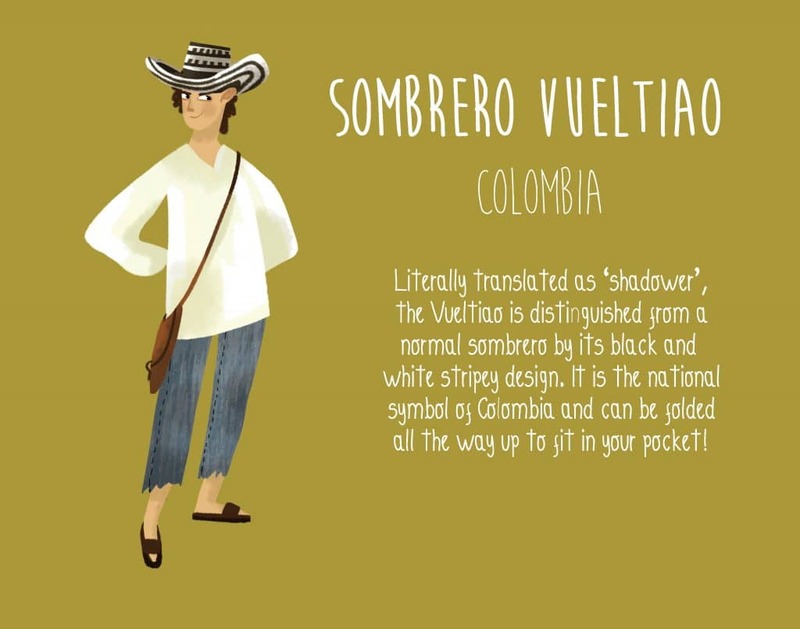 The Sombrero Vueltiao is distinguished by its famous black and white colouring and monochromatic design; but what really makes it awesome is the way that it folds away to provide a practical solution for travellers, or just anyone who spends a lot of time outdoors. It folds away into such a compact size that it can be carried in a trouser, dress or jacket pocket, making it one of the most handy fashion accessories in the world. This traditional hat is made from a unique material called Gynerium Sagittatum, which is a tall grass that grows up to 20 feet high; it’s a flexible cane that can be braided and folded easily, and the more flexible your hat, the better quality it is deemed to be! 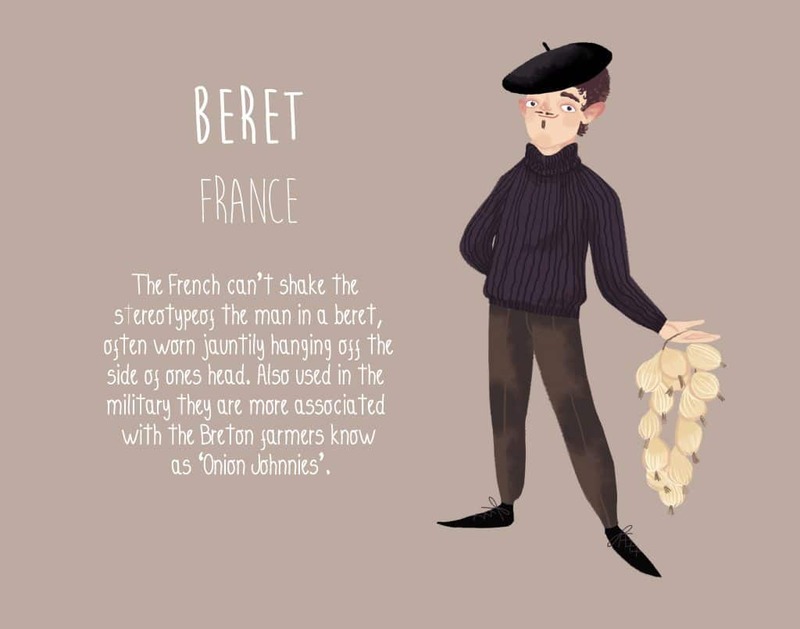 Mass production of the French Beret began in the 19th Century for use in the military, although some archaeologists have found evidence of a similar style of hat dating back all the way to the Bronze Age. Whatever the case, it wasn’t until the roaring twenties that the French transformed this military headpiece into a fashion statement and soon the rest of the Western world caught on and styled it as a go-to fashion accessory for both men and women. Some famous faces to have worn the French Beret throughout time include silent movie star Louise Brooks, Audrey Hepburn, Marilyn Monroe, Marlon Brando, John Lennon and Yoko Ono, and more recently Johnny Depp. Whilst the famous Lederhosen outfit has become something of a fun fancy dress costume all over the world, this traditional ensemble was once considered to be a serious wardrobe choice designed for those who needed to endure a full day of hard physical work; essentially, it’s a symbol of the tough and resilient working class. The Lederhosen was the working man’s garment of choice due to it being extremely durable (more so than most fabric garments) as well as being very easy to clean. 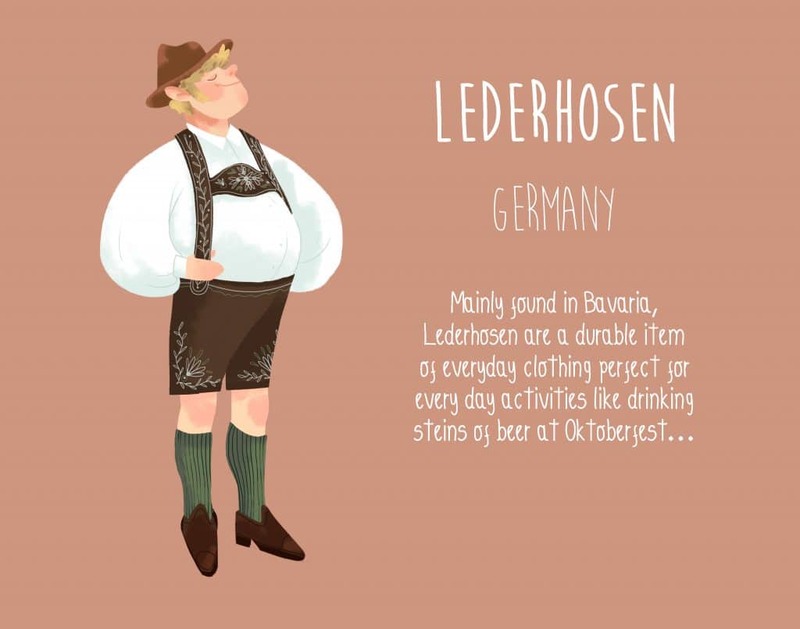 Today though, the Lederhosen is worn as traditional leisurewear, especially for national celebrations and festivals. So if you’re off to Oktoberfest this year, don’t forget to pack your Lederhosen! Believe it or not, Babouches have been reported as a must-have shoe for 2016 by Vogue Magazine; designer label Celine is already at it and there’ll be plenty more following suit as we head into the SS16 and AW16 seasons ahead. 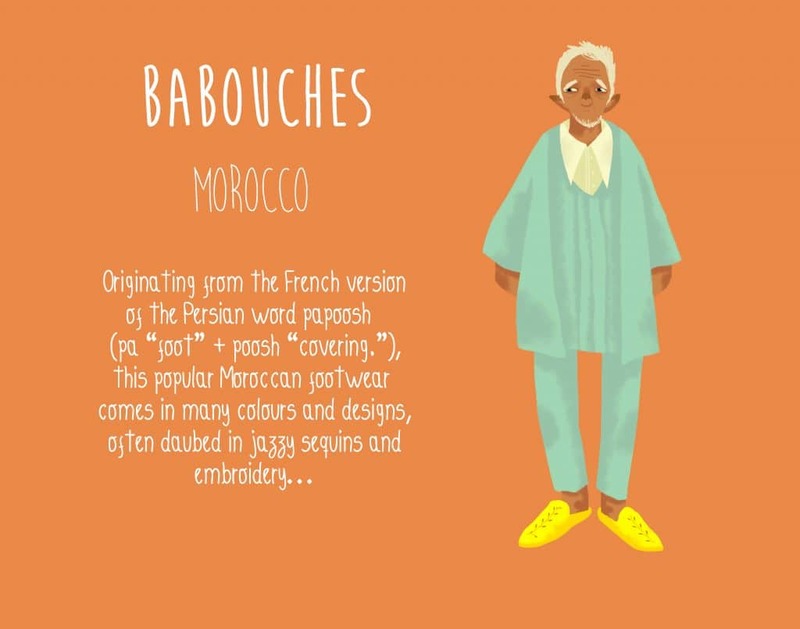 But these traditional shoes are much more than just fashion items for the people of Morocco; traditional Babouches are a must-have in hot weather and they are designed to offer both comfort and ease. Wear it just like a slipper and choose from a rainbow of different leather colours to suit your mood. Their androgynous and versatile look make them ideal for both men and women. We know what you’re thinking… wooden shoes? Ouch! But with every downside comes a flipside and what many of you may not realise about these popular souvenirs is that they were once essential for keeping the house warm too. 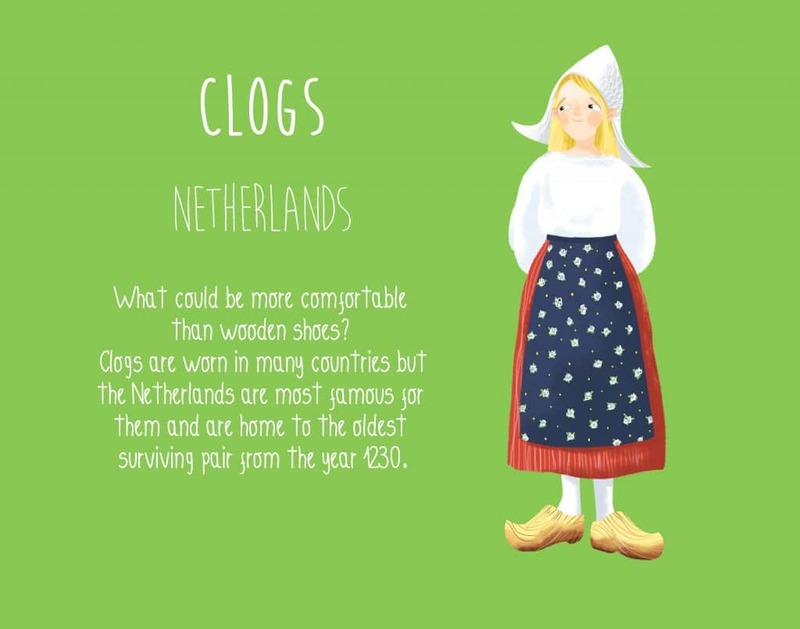 Once wooden clogs had become old, tatty and worn out from regular use by the wearer, they were chucked onto the fire for heating and cooking. Clever, eh? 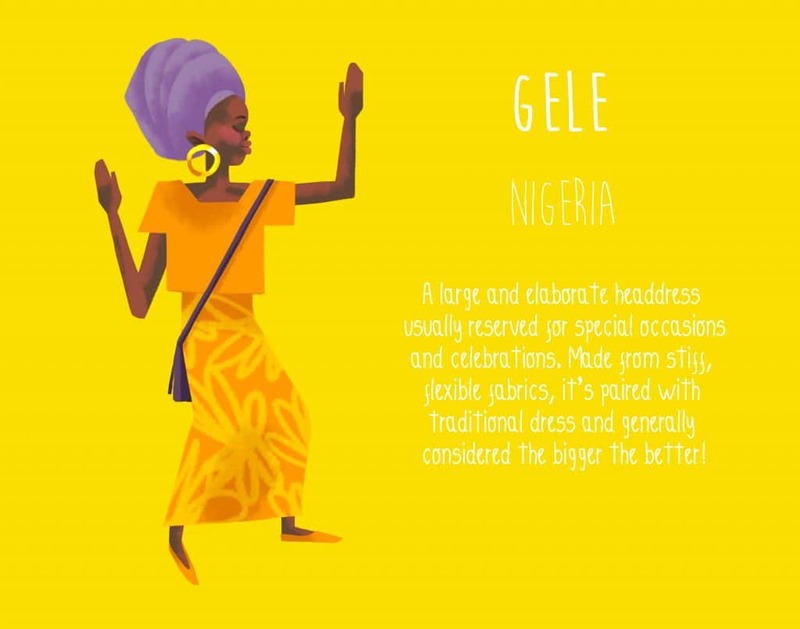 The Nigerian Gele is a traditional head tie, one which many women in Nigeria still wear to this day. Whilst, the Nigerian Gele is seen on plenty of elderly women, it’s also become a bit of a fashion statement with the younger women too. Tied together using stiff yet bendable Doek cloth, the Gele can come in a variety of bright and beautiful colours. And it seems that size does matter in this case – so don’t be afraid to make it as big and as bulky as your head can carry! In Norway, the term “Bunad” encompasses both traditional and rural clothing, dating back to the 18th Century and 19th Century, as well as folk fashion in the 20th Century. 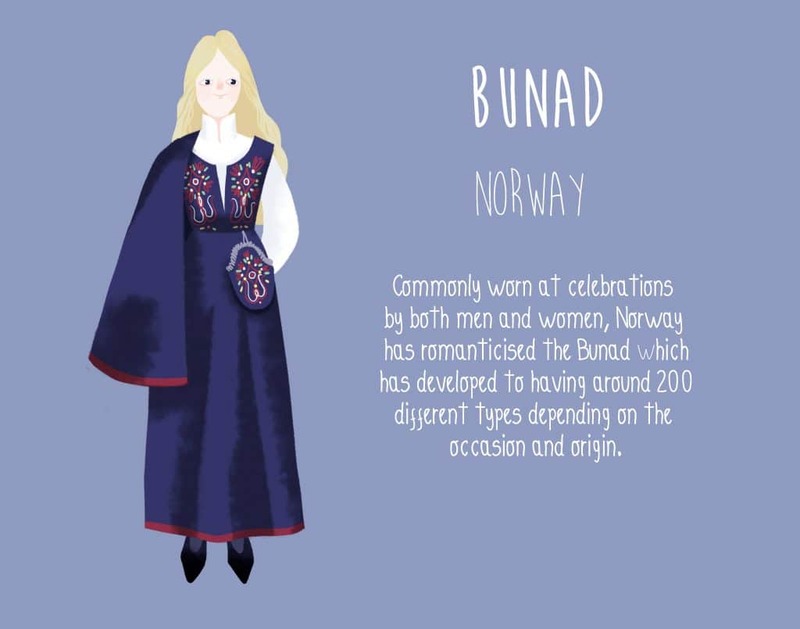 But before you hit the shops in search of yours, it’s wise to prepare yourself for the confusion surrounding this traditional Norwegian gown; there are now over 200 different styles of Bunad clothing, and each will depend on occasion and/or origin. So if you’re seeking out a traditional Bunad, it could be a good idea to conduct a little further research. 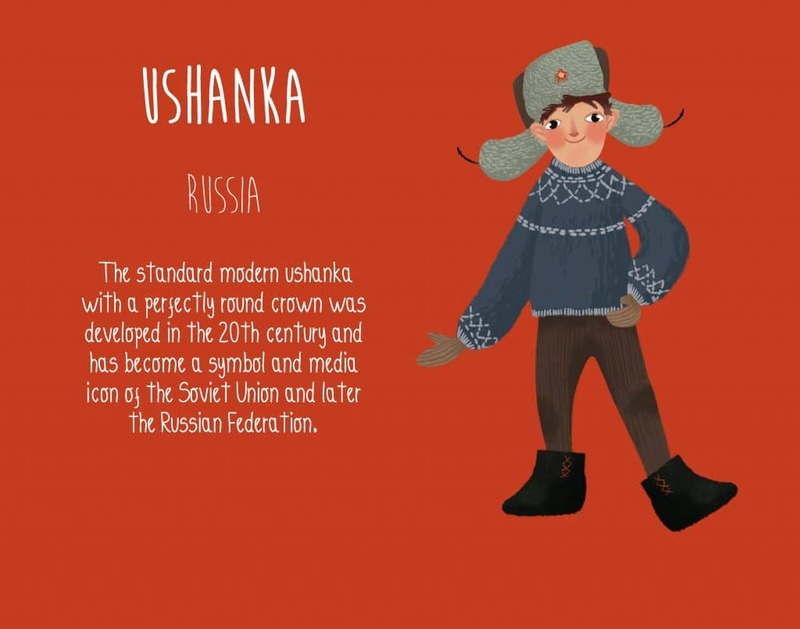 This traditional form of dress has strong links with the Romantic Nationalism movement, which saw countries such as Germany, Denmark and Norway take a special interest in primal culture and getting back in touch with one’s roots. This launched the largely popular trend of folk costumes across parts of Europe, and this movement resulted in the rebirth of the Bunad. If you visit Russia, you simply can’t leave without buying yourself a typical Ushanka. Travel there in the winter season, and you’ll understand exactly why it is necessary. This Russian fur cap is not only distinctive in its unique style but it’s the only thing that will keep your whole head warm when the weather is painfully cold outside. Made from quality sheepskin and Muskrat fur and with heat-storing ear flaps that can be fastened together at the chin, these handy hats can protect even against “deep frost” conditions, including temperatures of -40°C to -70°C. But ask a Russian soldier and he may even tell you that the purpose of this hat is to protect you from sudden and painful blows to the head. Interpret it how you will but one thing’s for sure – the Ushanka isn’t going to leave you shivering. 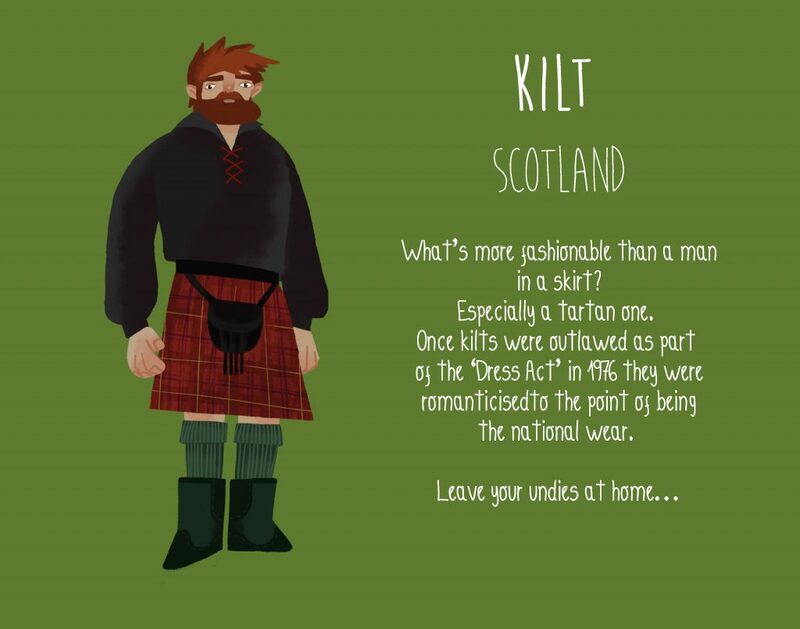 Whether you choose to wear boxers or leave your underwear at home, there’s no denying that a kilt will get you noticed. Kilts are a pleated skirt style garment, worn by Scottish men (most often for formal occasions or celebrations). Scottish kilts originate from the Highlands as the traditional dress for men and boys during the 16th Century. National Romanticist movements during the 19th Century brought them back to life and they have since become a well-recognised symbol of Scottish culture. The typical kilt uses a unique 2:2 weave, which creates a very distinctive diagonal weave pattern and combines this with a traditional tartan. Standard sizes are available for those in search of a ready to wear kilt design but traditionally, a kilt is always made to measure for the perfect fit. It doesn’t get comfier than a pair of baggy trousers – especially if you’re travelling around in hot weather. This is what makes the traditional Turkish Salvar the perfect pair of backpacker’s pants. These trousers were ejected from society during Mustafa Kemal Atatürk’s political and social reforms but they soon made a fashion comeback and are now worn by the more traditional men and women in many areas of Turkey as well as being sold to tourists in resort gift shops. 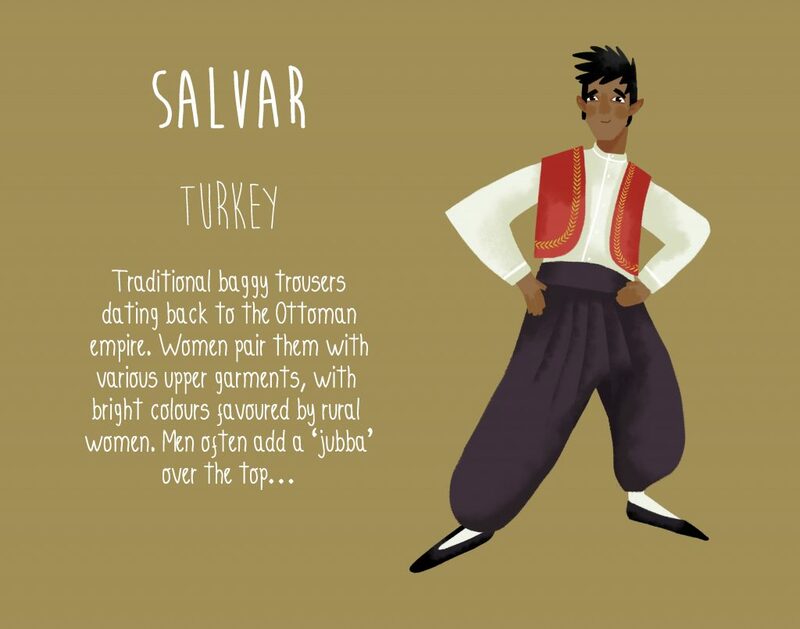 Unlike other popular pieces of traditional dress from other parts of the world, the Salvar trousers are not indicative of class, political stance or social status, so anyone from any walk of life can wear the traditional Salvar with pride. 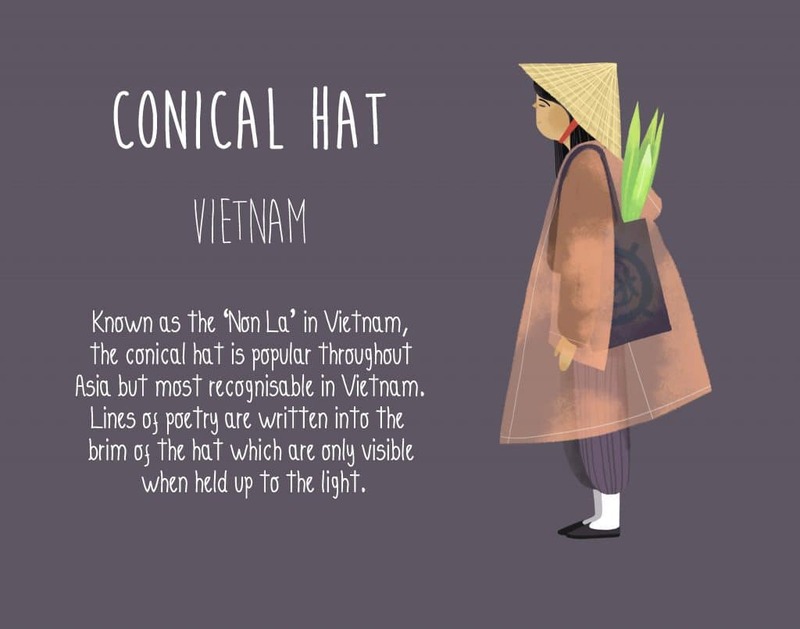 The conical hat – known as the “Non La” in Vietnam – is possibly one of the most recognised pieces of headwear in the Eastern World. Worn by farmers in a number of South East Asian countries, the conical hat is a truly iconic symbol of the Orient. But that doesn’t stop the West from trying to emulate; like the Orientalist fashion movement in the 20s, it seems that we simply haven’t stopped our obsession with Asia. You might find it interesting to know that many a conical hat has graced the fashion catwalks of London Fashion Week and Paris Fashion Week, thanks to designers such as KTZ, Schiaparelli, Dimaneu and Alberta Ferretti. So from the rice paddies of Sa Pa to the runways of Carrousel du Louvre, the Non La hat has relevance wherever you go.